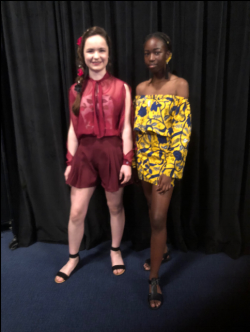 Ella Waddy and Sophie Mumbi represented the College at the Apex Australia Teenage Fashion Awards on Saturday the 25th of August, at Lake Joondalup Baptist College. The girls entered their garments in the Daywear section and were both selected to go to the Apex State Finals on Saturday 15th of September at the Mandurah Performing Arts Centre. Congratulations go out to the girls, as the standard of work at this competition is very high.